One of the most frequent questions we get is "Don’t farmers own all of the land they farm?" The short answer is no, but farmers are often looking to grow their business by farming more acres. They already own the tractors, have employees, etc., so many of them end up renting land they don’t own to farm. In fact, per USDA research, almost 40% of all farmland is rented out. 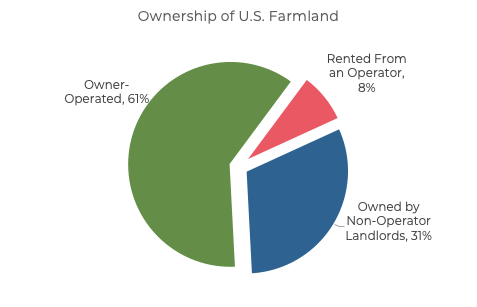 The chart above shows 61% of crop land is owner-operated (typically not rented or leased). However, much of that land is only partially owned by the farmer. Often cousins, siblings, and even neighbors will own land together. In reality, situations in which a farmer owns cropland outright make up a much smaller percentage of land. This is one of the many ways AcreTrader helps farmers and landowners. Individuals selling a minority share of a property join with buyers wanting to be aligned with long term owners. Often, land is partially owned by the farmer operating the land and a few relatives, and we can provide an attractive solution for all parties involved. 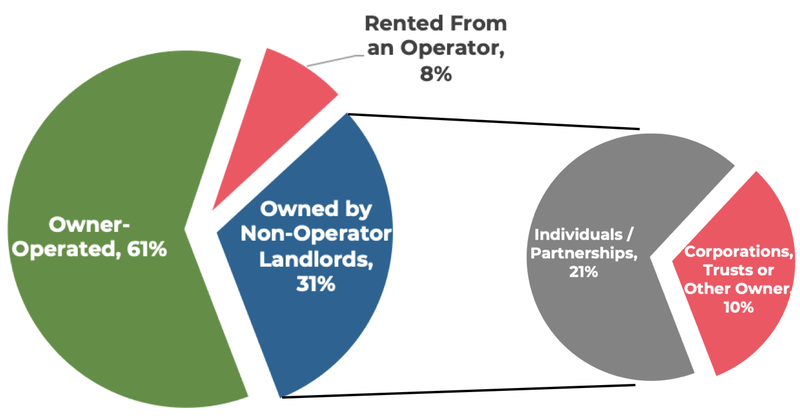 Breaking down Chart 1, Chart 2 below shows that the majority of non-operator landlords are actually individuals owning whole parcels. While 21% of farmland is owned by individuals and partnerships, an even smaller amount is owned by corporations, trusts, or others. However, companies and trusts are often set up for those who inherit land and no longer live near a farm. Thus, for argument's sake we could say less than 5% of US farm land is owned by professional or semi-professional investors. In what other asset class is less than 5% of a several-trillion-dollar market owned by professional investors? And, why don’t more investors own farmland? We believe high barriers to entry keep most people out of this asset class. For most, buying an individual farm is too expensive, the asset is illiquid on its own, and good deals are hard to identify without experience and research. Despite the historical difficulty of investing directly in land, it is an attractive asset class that has appreciated greatly over time and often protects capital during times of economic turmoil. This is where AcreTrader comes into play. We allow investors to own farmland without the traditional frictions and headaches. It is simple: buy shares of land on AcreTrader and receive annual rent from the farmer while the underlying land increases in value over the long-term. Note: The information above is not intended as investment advice. Data in the charts above is sourced from the USDA Economic Research Service and National Agricultural Statistics Service, 2014 Tenure, Ownership, and Transition of Agricultural Land (TOTAL) survey. 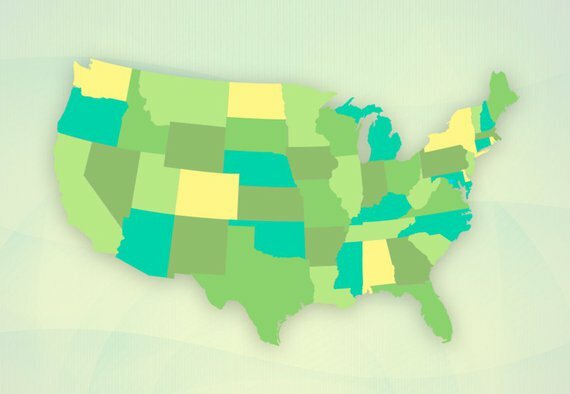 Data excludes Alaska and Hawaii. Additional calculations and analysis performed by AcreTrader. Past performance is no guarantee of future results. 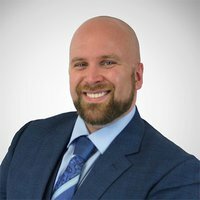 For additional risk disclosures regarding farmland investing and the risks of investing on AcreTrader, please see individual farm offering pages as well as our terms and disclosures.